Another Star for ONE DAY AND ONE AMAZING MORNING ON ORANGE STREET! A lovely starred review for the audio version of Joanne Rocklin's book, read by Lisa Baney. Joanne's next book, also a middle grade, THE FIVE LIVES OF OUR CAT ZOOK, is due out spring 2012, also by Amulet/Abrams. Starred review from the August 15, 2011, Publishers Weekly for Mary Lyn Ray's STARS! One of my favorite ways to learn about historical important events is through the eyes of children. It just seems that it's easier to see how other times affected real people every day when a child is in the picture—it's no longer theoretical or abstract at that point for me. Hence Cynthia Levinson's WE'VE GOT A JOB, due out early next year from Peachtree. Susan Lynn Meyer's middle-grade novel BLACK RADISHES portrayed rural France in World War II through the eyes of a character modeled after her father, and it was recognized with great reviews and a Sydney Taylor honor. The sequel is underway. But Susan has also turned her attention to another period of history now: the South during the struggle for Civil Rights. In Susan's picture book manuscript NEW SHOES, the simple act of trying on new shoes becomes a symbol of this struggle when two children boldly find their own creative way to take their rights into their own hands. I am thrilled to announce that this manuscript has just been acquired by Sylvie Frank at Holiday House. I can't wait to see it brought to further life with amazing illustrations! What's Next From Mary Lindsey? With her much-buzzed debut novel SHATTERED SOULS still several months pre-release (look for it everywhere in December 2011! ), Mary Lindsey has some more good news to celebrate: This week she accepted an offer for her second novel, which will also be edited by Jill Santopolo for Philomel Books. Tentatively titled ANNABEL, this dark YA is loosely based upon Edgar Allan Poe’s final poem Annabel Lee, and tells about a pair of star-crossed lovers caught in a doomed struggle between forces of ancient malice and evil. Rooted in Celtic mythology and steeped in creepy Gothic lore, this is a riveting read that you will not want to miss! Many congratulations to you, Mary! Elliot and the Pixie Plot by Jennifer Nielsen (Sourcebooks/Jabberwocky) is the continuing story of Elliot, King of the Brownies, as he learns a thing or two about elf magic and saves his kingdom from the ongoing antics of feisty goblins. 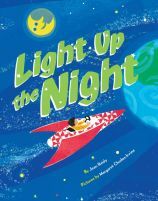 Kirkus gives a starred review to LIGHT UP THE NIGHT, an upcoming picture book by EMLA author Jean Reidy (published by Disney/Hyperion, October 2011).